If you are someone who loves his or her privacy and want to protect your personal data from prying eyes then a passcode on an iOS device is a must have. While passcodes are safe, things can get out of hand if someone discovers your passcode and you don’t know about it. A new tweak called Battery Passcode takes care of that by changing your iPhone or iPad’s passcode after every few minutes. What this tweak does is it takes the current battery percentage and uses that as your passcode. For example if your iPhone is running at 29% battery level then your passcode at that point in time would be 0029. If you go down or above that to say 54% then your passcode would be 0054. Battery Passcode works this way from 1 to 99 percent however if your device is fully charged then you will have to enter 0099 to unlock your device. 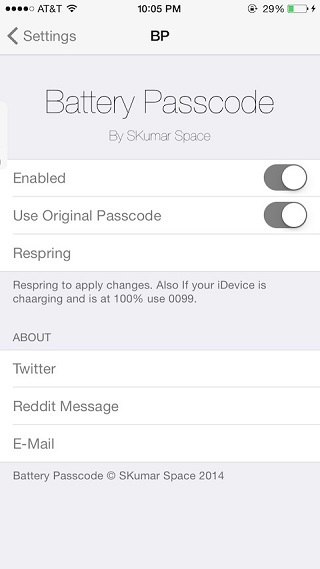 From settings you can enable or disable the tweak. There’s also an option for using original passcode. This should be enabled if you want to use your original passcode as a backup, which is highly recommended. Also, remember to turn battery percentage on before activating this tweak otherwise its useless and you may end up locked out of your device. If Battery Passcode is something that interests you then head to Cydia’s BigBoss repo, where it is available as a free download. Check out more lockscreen tweaks on our dedicated page here.